Yes by all means you should live a “perfect” life. n. – the condition, state, or quality of being free or as free as possible from all flaws or defects. Ever met someone who was a spiritual perfectionist? Or someone who lived their spiritual life in trying to be so perfect they tried to manage, control, or manipulate their life to project they “have it all together?” Yea I’ve never meant one either (cough cough). Yes I have been guilty of this in my life. This word “perfection” in the above Scripture has often been misunderstood and even twisted down through the years. Its even been dumbed down and included on bumper stickers like “Christians aren’t perfect; only forgiven” (insert child like sneer). Even in this bumpersticker a noble minded Christian is furthering the misunderstanding of this word. This verse has been used by Christians who tend to be legalistic in nature. I used to They use it to justify their self-righteousness and in doing so tarnish and twist the original meaning and context of this word. I used to live and think that to make the Father proud, to do this “Christian thing” right, I had to be perfect. I had to analyze my daily list of do’s and don’ts. I had to have all my stuff together. I had to ensure that each thing was lining up for my moral life so that what I was projecting on the inside really was perfect just like Jesus says. Thankfully, I have come to understand what Jesus was saying. A Harmful Word or An Unfortunate Translation? “Perfectionism is one of the scariest words I know. It is a marked characteristic of contemporary American culture, a serious psychological affliction that makes people too timid to take necessary risks and causes them to suffer when, although they’ve done the best they can, their efforts fall short of some imaginary, and usually unattainable, standard. Internally it functions as a form of myopia, a preoccupation with self-image that can stunt emotional growth.” Amazing Grace, 55. Norris is right on. This is a frightening verse and word for many of us. Thankfully when we look at the Christian landscape it is not so much a scary word that has harmed us but rather a scary translation. What often happens in the transmission between the Greek text into English is that we impose certain meanings on the original language that were not present in the original context. This is one of those times. On this one, we are imposing our American and Western understanding of perfection as opposed to a first century understanding of τέλειος which when transcribed is teleios. This is usually what our concept of perfection in American society and even the American church looks like. Sadly, we’re missing it. Teleios, in the way Jesus used it and in this context refers not to a purity that is free from flaw or garnishment but rather a word that denotes a completeness, maturity, full-grown, and developed. Kind of like the perfect Cabernet wine. Is a perfect wine one that is bottled perfectly, fermented perfectly, and free from any imperfection? Some would say yea. However the majority would say the perfect wine is one that has aged well. Over time. One that matured. One that has grown complete with time. This stands in serious contention with our imposed meaning which usually involves setting forth an impossible goal, living without flaw, and so on. This certainly does not give one license to live without holiness, morality, and a certain godliness that (along with our actions) marks us as different from others who do not follow Christ. But understood in the proper context, holiness is part of maturity. A mature follower of Jesus will understand that we lose certain liberties in following Jesus. Certain actions or ways of thinking that without the knowledge of Christ we were free to partake in, are left/ should be left behind us. These things should be realized through walking with the Holy Spirit. Not the legalistic pressure of others around you. To be “perfect” in the way Jesus is calling us to be in this context means to make room for growth and to do so on purpose. It is to make the necessary changes which bring about maturity or ripeness. As Norris says, “To mature is to lose adolescent self-consciousness so as to be able to make a gift of oneself, as a parent, as teacher, friend, or spouse.” (Amazing Grace, 56) In other words, to mature, to be perfect, is to leave behind our childish ways so that we may prosper in any given role or position God has us in. Jesus embodied this. 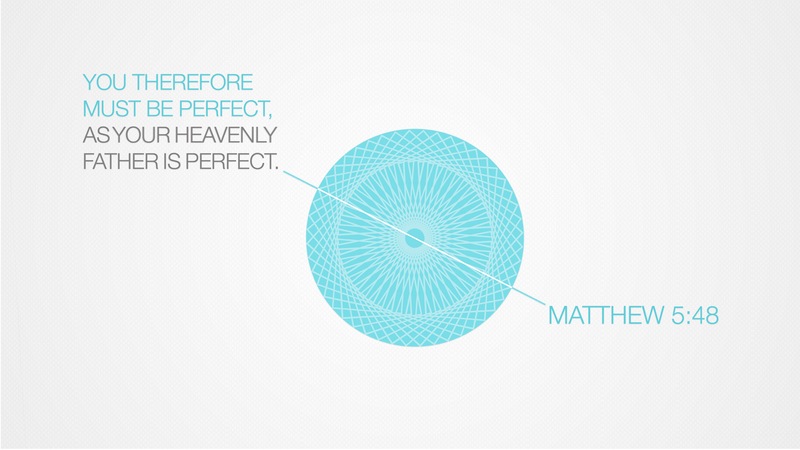 In fact Jesus gives us an amazing window into what perfection really is. For him it was being mature enough to give yourself to others. Whatever we have or whoever we are, no matter how little it seems, is something that can be given and shared with others around us. That requires a mature perspective that as followers of Jesus we aren’t here for ourselves. We are here to draw everyone around us to the love and joy of knowing Christ. That is the glorious summation of our lives as followers of Christ. It is one that is glorious, adventurous, and perfect. Whether married, single, with kids, no kids, or any other situation–we are to live this life. A life clinging to this world, status, material goods, or anything else we try and fill that God-sized hole with would be an imperfect and immature life. One that is stunted by the frivolous things of a society that has lost its way in the tragic depths of shallowness. Life is to be lived in the perfection Jesus calls us to live in. A perfection marked by growth. Not a lie of “having it all together.” A perfection marked by honest and authentic faith. Not a shallow veneer of sinlessness and self-righteousness. A perfection marked by the tension of seeking holiness and acknowledging brokenness. Not an embarrassing and harmful projection that one has already arrived. May all of us be driven by this daily desire to grow in Him. Let it be our prayer that in all of our hearts what drives us is not a worldly image of perfection but rather a Christlike pursuit of growth and maturity. How about you? How do you understand perfection? Is it hard to break away from societies concept of perfection and embrace the biblical one? Why or why not? This entry was posted in Culture, Journey, Life, Scripture and tagged Amazing Grace, authenticity, grace, Greek, growth, Jesus, Journey, Kathleen Norris, Life, mercy, Perfection, self-righteousness, translation on December 10, 2015 by Noah D. Schumacher. I as a woman have struggled with this big time. Trying to make my like look like it is full and happy and my kids are great and I had an awesome house. And I realized by doing that I only ask other moms to feel and do the same way, with out most of them knowing. I try and be real, try and take imperfect pictures. Take sleepy pictures with no makeup. I am not perfect and defiantly don’t want anyone to think that. I struggle like everyone else, but I do have a new desire and have turned to God to fill many of the things I had been filling with this of this world. I am so much more free to just be ok if everything isn’t just right and that, it’s life, I can’t do it all! Thanks for just making this be something that is a nice reminder that we are called to something different.